I think that the NRA would be more successful if they said that Obama had a long history of supporting bans on gun ownership. Rep. John Dingell, D-Mich., and Sen. Blanche Lincoln, D-Ark., spoke at a National Wildlife Federation briefing Wednesday afternoon, pushing efforts to expand conservation areas for hunting and fishing grounds as well as better protection of the environment for sportsmen. . . .
"With Sen. Obama you have a lifetime record of supporting gun control, voting for gun control, speaking out against gun rights and voting against gun rights either as an elected official or a private citizen," said Andrew Arulanandam, an NRA spokesman. . . . The gun shown here, a Webley, is up for sale in London for £150, one of hundreds of such weapons that are easily and cheaply available on the streets of the UK's big cities, a Guardian investigation can reveal. The variety of weapons on offer in Britain is extensive and includes machine guns and shotguns, as well as pistols and converted replicas. A source close to the trade in illegal weapons contacted by the Guardian listed a menu of firearms that are available on the streets of the capital. "You can get a clean [unused] 9mm automatic for £1,500, a Glock for a couple of grand and you can even make an order for a couple of MAC-10s," he said. "Or you can get a little sawn-off for £150. They're easy enough to get hold of. You'll find one in any poverty area, every estate in London, and it's even easier in Manchester, where there are areas where the police don't go. "People who use shotguns tend to be lower down the pecking order. There is less use of sawn-off or full length shotguns, and if a criminal wants street cred, he wants a self-loading pistol, a MAC-10 or an Uzi submachine gun." . . .
Sen. Barack Obama's campaign just won't let the gun issue rest. Mr. Obama and his campaign surrogates continue to assure gun owners that he is on their side, and it appears to be paying off. John McCain only leads Mr. Obama among hunters by 14 percentage points, just about half the 27-point lead that President Bush held over John Kerry in 2004. If Mr. McCain had a similar lead, he would be ahead in most polls, particularly in many battle ground states. Yet, despite all the Democratic claims to the contrary, Mr. Obama is undoubtedly the most anti-gun candidate ever nominated by a major party for president. A couple of weeks ago, Brian Schweitzer, Montana Democratic governor, told national reporters that Mr. Obama "Ain't ever going to take your gun away." An Obama adviser, Stanford Law Professor Larry Lessig, said recently on Hugh Hewitt's national radio show that "I think that he has always been an individual rights person on the Second Amendment." Another advisor, Professor Cass Sunstein at Harvard, told Time Magazine in June: "Obama has always expressed a belief that the Second Amendment guarantees a private right to bear arms." The list goes on. . . . This must be one of the smallest poll bounces from a nominee's acceptance speech in modern times. The Gallup poll from Wednesday night showed Obama ahead by 6 points. The Gallup poll from Thursday night shows Obama up by 8 points -- just a two percentage point increase. The Rasmussen poll shows a slightly larger 4 percent point increase. John Fund: "Democrats and the Non-secret Ballot"
". . . the Obama campaign was seriously considering letting delegates vote by secret ballot, the better to avoid intimidation and fear of reprisal from local party bosses. But the plan -- which was pushed on the Obama camp by supporters of Hillary Clinton -- was suddenly dropped when it was realized that a key plank of the Democratic Party platform backs a so-called "card check" provision being added to the nation's labor laws. Card check would effectively strip workers of the protection of secret ballots in union elections. Business groups and former Democratic presidential nominee George McGovern oppose the measure on the grounds that it exposes workers to harassment and intimidation. That was precisely the concern of Democratic delegates who wanted to cast a secret ballot vote on the convention floor. The Obama campaign thought seriously about accommodating them until it realized how such a naked contradiction to the party's stance on union balloting might look to voters and the media." 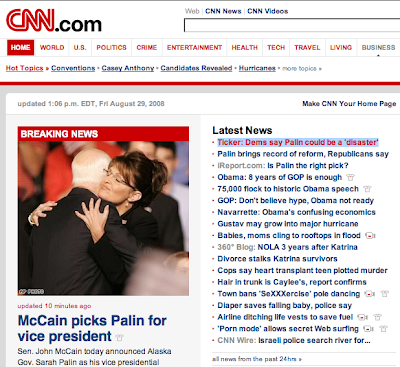 CNN: "Dems say Palin could be a 'disaster'"
This is a nice measured response from the Dems. I wrote back in June that Palin was my choice! "Which Serenity character are you?" I almost never take these types of quizzes, but I was a fan of the series. Keep in mind that the average growth rate for the economy over the last few decades is around 2.4 percent. Looking over this whole period, the growth rate doesn't look that unusual to me. Well, if young people are going to make the difference this fall, you sure couldn't tell it from the rates that they are watching the convention. 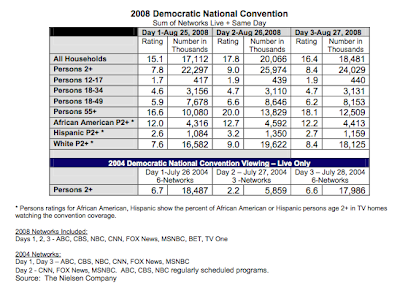 The rate that 18 to 34 year olds are watching the convention is a third of the rate that those over age 55 are watching. I would think that the "profiling" here involved the person cutting the bike lock. Campus police at Harvard University are under scrutiny, as the Ivy League school this week launched a review of the department amid allegations of possible racial profiling of students and professors. . . .
"The review will include consideration of HUPD's diversity training, community outreach and recruitment efforts, as well as the ways in which Harvard's past experience as well as best practices elsewhere can help inform our future practice," Faust said. The statement referenced an incident that occurred earlier this month in which police confronted a person using tools to remove a lock from a locked bicycle. "It was later established that the person was working on the Harvard campus for the summer, owned the bicycle and was trying to cut the lock because the key had broken off in that lock," Faust wrote. According to the Boston Globe, that person was a young black man. An unnamed source told the Harvard Crimson, "The conversation between the individual and the officers was laced with obscenities." That source told the paper that the officers have allegedly been placed on administrative leave pending an investigation. . . .
Saturday, Mr. Biden asserted Mr. Obama "made his mark literally from day one, reaching across the aisle to pass legislation to secure the world's deadliest weapons," a claim similar to one Mr. Obama made earlier in the campaign. Wednesday night, Mr. Biden was more expansive, claiming Mr. Obama was a leader "to pass a law that helps keep nuclear weapons out of the hands of terrorists." This implied a big, important controversial measure, passed with difficulty after the intervention of an extraordinary leader. In reality, the Lugar-Obama Bill was passed on a voice vote on December 11, 2006. It was so routine, there was no recorded vote. The media didn't consider it important or controversial. Neither the New York Times nor the Washington Post reported its Senate passage, though the Post ran a 798-word op-ed by Senators Lugar and Obama the week before it was approved. It was not the subject of a story on the CBS, ABC or NBC evening news--not when it passed, not when it was signed, not ever. No story about it appeared in Roll Call or The Hill, the daily newspapers that cover the minutiae of Congress. It drew only one squib in Congressional Quarterly--and that story didn't mention Obama, just Lugar. The Bush administration supported it. The legislation required the administration to report to Congress within 180 days "on proliferation and interdiction assistance" to secure the mostly conventional weapons stocks littering the nations born from the collapsed Soviet empire. It created a new State Department office to support the Bush administration's "Proliferation Security Initiative" aimed at interdicting weapons of mass destruction and conventional weaponry. And the bill authorized $110 million in funding. But this legislation didn't require a profile in courage to co-sponsor or hard work and powerful persuasion to pass, as Mr. Biden implied. . . .
Saturday, Biden proclaimed: "But I was proudest, I was proudest, when I watched him spontaneously focus the attention of the nation on the shameful neglect of America's wounded warriors at Walter Reed Army Hospital." The problem for Mr. Biden (and the object of his praise, Mr. Obama) is the problems at Walter Reed were revealed in articles in the Washington Post, starting February 18, 2007. Unless Mr. Obama writes for the Washington Post under the nom de media of Anne Hull or Dana Priest, he didn't "spontaneously focus the attention of the nation." The two reporters did. The legislation to correct the shortcomings emerged from a Senate committee Mr. Obama doesn't serve on and he played no significant role in drafting or pushing it through the legislative. Mr. Obama is not the real hero of the Walter Reed turn-around, despite Mr. Biden's extravagant claims. . . .
A podcast of this interview with the bizarre response that it generated from Obama supporters is worth listening to. What does Karl Rove know that we don't know? Why is Rove fighting so hard at the last moment to get Lieberman removed from consideration as VP and Romney included? Republican strategist Karl Rove called Sen. Joseph I. Lieberman (I-Conn.) late last week and urged him to contact John McCain to withdraw his name from vice presidential consideration, according to three sources familiar with the conversation. Lieberman dismissed the request, these sources agreed. Lieberman “laughed at the suggestion and certainly did not call [McCain] on it,” said one source familiar with the details. Rove did not immediately respond to a request for comment. . . .
His decision to wade into the vice presidential selection process could provide Democrats fresh ammunition to tie McCain to the polarizing Bush. It is also chafing some Lieberman allies and others wary of the selection of former Massachusetts Gov. Mitt Romney. “Rove is pushing Romney so aggressively some folks are beginning to wonder what's going on,” grumbled one veteran Republican strategist. Sarbanes-Oxley was found constitutional by a 2-to-1 decision in the DC Appeals Court. Hopefully the Supreme Court will take the case. The NY Sun has an excellent article on the Appeals Court decision here. The question posed by the case, Free Enterprise Fund and Beckstead and Watts, LLP v. Public Company Accounting Oversight Board et al., had nothing to do with whether the auditing requirements and increased criminal liability and penalties of Sarbanes-Oxley have hurt our public companies, and, by extension, every American with a stock portfolio or a pension plan. The issue is whether Sarbanes-Oxley's creation of an agency to police auditors of public companies violated the doctrine of separated powers. The chief constitutional problem with the law is that the five board members at this new agency — the Public Company Accounting Oversight Board of the suit's caption — aren't appointed by the president. Nor can the president fire them. Instead the commissioners of the Securities and Exchange Commission, who are presidential appointees, get to do the hiring and firing for the new Oversight Board. And the firing can only be for cause. The result is a regulatory agency whose top officials — unlike those in the SEC, Justice Department, and Treasury Department — are well insulated from the elected leader of the executive branch. It's as though Congress wanted to add to the judicial, legislative, and executive branches, a new independent branch of government: the auditors. . . . Researchers from Surrey University in England have found that eating two eggs a day could help you lose weight and lower your cholesterol levels, London’s Daily Mail reported Tuesday. Medical experts have long thought that by eating large amounts of cholesterol-rich foods such as eggs, a person could easily increase their cholesterol levels. However, an upcoming article in the European Journal of Nutrition will suggest otherwise. . . .
Griffin thought that by eating eggs for breakfast, the volunteers felt fuller longer, which aided them in their weight loss efforts. A lot of detailed data is available from Chronicle of Higher Education. It is time to fess up and admit that I have gotten at least two predictions wrong this year. 1) When things were looking bleak for Hillary Clinton in March, I predicted that she would still win the nomination. 2) I predicted that if Obama won the nomination, he would pick Bill Richardson as his VP. Racial animus in Denver: "Obama Mentor called be 'Uncle Tom'"
Racial infighting among Democrats, which marred the presidential primaries, has flared up again at the party’s convention in Denver, where a black Hillary Clinton delegate is accusing a black Barack Obama delegate of calling her an “Uncle Tom.” . . . If a weather expert tells you what the weather will be on a specific day next year, you can safely ignore him. If he tells you a hurricane is heading your way, it's a good idea to get out of the way, even if the storm ends up turning. That's playing the odds. Likewise, if an economist tries to tell you where the stock market will be in a year, you can safely ignore that. But if he tells you a gas tax holiday is an unambiguously bad idea, that's worth listening to, especially if economists on both sides of the aisle agree. By analogy, a mechanic knows that changing your oil is good for your engine, but he can't tell you what problems you will have with your car next year. You shouldn't ignore the mechanic's advice on changing oil just because he doesn't know when your battery will die, or because he didn't personally perform any scientific studies on oil changes. Doctors are often wrong, but you are still better off going to the doctor than diagnosing problems yourself. And when you get the opinions of several doctors, your odds improve, even if those several doctors aren't a scientific sample. The important thing is that following a doctor's advice, or the consensus of several doctors, increases your odds compared to the alternative. And the more doctors the better. Some of you noted that the candidates have top economists on their payrolls, so voters can be assured any president is getting good advice. But realistically, an economist involved in a political process has to support the candidate's ideas or he's off the team. At best, one of the candidates obviously has bad economists advising him because they disagree with the other guy's economists. . . . Thanks to Tom P for this link. At a dinner with Washington Post reporters and editors, Strickland called the coverage "almost shocking at times" and unfair it the treatment of both candidate Clinton and her husband, the former president. "Quite frankly, some of the people that I had most previously admired as commentators I have a remarkably different opinion toward right now," Strickland said. Strickland was the second big-state governor and Clinton supporter to sound off about the press at the convention. On Sunday, at a panel hosted by Harvard's Shorenstein Center, Pennsylvania Gov. Edward Rendell called coverage of Barack Obama's campaign "embarrassing"
"He is running for the most important office in the world," Rendell said. "He basically got a free pass." Rendell also described MSNBC derisively as "the official network of the Obama campaign." Strickland was one of Clinton's strongest supporters and helped her carry the Ohio primary in March. In his critique, he did not single out any commentators by name. But he was sharply critical of the treatment Clinton got at two debates just before the Ohio primary, noting that she was repeatedly asked questions first, giving Obama the benefit of being able to shape his answer in response to hers. . . .
CNN's Jessica Yellin revealed over the weekend that Mr. Obama's key aides "think the press loves Biden and so the press will sort of go easy on him on the past gaffes and when he's contradicted Obama." The Politico has this amazing discussion. What makes it more amazing is the way the "big-time media figures" tried to force him to stop talking. Here is a former head of the Democratic Party, a politician as liberal as any major political figure, and governor of Pennsylvania who was upset about the media being biased against Clinton and for Obama and he is treated as some loony uncle. "Ladies and gentleman, the coverage of Barack Obama was embarrassing," said Rendell, in the ballroom at Denver's Brown Palace Hotel. "It was embarrassing." Rendell, an ardent Hillary Rodham Clinton supporter during the primaries, now backs Obama in the general election. Brokaw and Rendell began debating campaign coverage, including the on-air comments by Lee Cowan, and when MSNBC came up, Rendell went after the cable network. “MSNBC was the official network of the Obama campaign," Rendell said, who called their coverage "absolutely embarrassing." At that point, PBS's Judy Woodruff, who was moderating the moderators event, said: "Why don’t we let Governor Rendell sit down." That was met with applause from the crowd of big-time media figures, which included Arianna Huffington, Gwen Ifill, Al Hunt, and Chuck Todd. Woodruff allowed Brokaw to respond, and in defending the network, he said that Matthews and Keith Olbermann are "not the only voices" on MSNBC. Mr. Rendell, a Hillary Clinton backer, came to bury the Big Three, not to praise them. He told the crowd of 300 political luminaries that the media's coverage of the Democratic primaries had elevated personalities over substance and he complained of sexism in its treatment of Senator Clinton. He called the media's kid-gloves handling of Barack Obama "absolutely embarrassing," and suggested that the media had essentially given the presumptive Democratic nominee, whom he now supports, "a free pass." Journalists, he said, had allowed themselves unprofessionally to be "caught up with emotion and excitement" in the historic nature of the Obama candidacy. He even called MSNBC "the official network of Obama's campaign." Tom Brokaw jumped to his network's defense, saying he and others had expressed dissatisfaction with on-air comments by NBC reporters like Lee Cowan. He also agreed that MSNBC's Keith Olbermann and Chris Matthews had "gone over the line" at times in comments about Mrs. Clinton but emphasized they were "commentators" and not reporters. Mr. Rendell wasn't mollified. "Chris Matthews loses his impartiality when he talks about the Clintons," he told the audience. At that point, moderator Judy Woodruff moved to wind up the proceedings before they could become even more heated. Many in the audience were surprised at the extent to which Mr. Rendell was still carrying a torch for Hillary Clinton and criticizing media coverage of Barack Obama. "I thought he was a Democrat," one person next to me commented. "Here, he is a Hillarista first," her companion commented. "Her campaign for the next presidential election begins at this convention." Would anyone know from listening to the news coverage that the 2008 Olympics represents the best US showing in total medals ever? The only two Olympics where we did better were in 1984 when the USSR and Eastern Europe boycotted and 1904 in St. Louis when almost no other countries participated. How about the fact that we did as well in gold medals as we did in 2004? The End of Conservative Talk Radio? You know I'm one of the other things we talk about this book the accidental terribly important is the wave that you liberals are going to try to kill. Talk radio. And we just had Nancy Pelosi just endorsed the fairness doctrine. But Obama says. But he's not a fairness doctrine he's forward -- he thinks it's it's a distraction from the real issue which should be diversity. And nobody understood quite what he meant to but I do. We have that we covered in this chapter on talk radio there is a little known provision of the FCC law Federal Communications Commission. That provides that the stations that use the public airwaves must have community representation. On the board of directors and in the station management. And we have memos from the Soros organizations and media matters. That indicate that what they are planning to do is to put liberal on those stations boards. And in this program directory assistance program director and station it's as part of that FCC rule. So it's not just questioned -- talk radio to question hijacking. This could have been stronger if the ad had noted not just that Clinton had been passed over, but that it turns out that despite Obama's statements in the past, Clinton was never considered. Possibly, the ad could have even quoted from the headline in the Politico, "Hillary gets stiffed." For those interested in the audio version of my book Freedomnomics, they can find it here. I think that the narrator, Brian Emerson, did a very good job on the book. Strangely the video only looks at the numbers for this decade. Will Bush get credit for this? Supporters of the right to keep and bear arms have long recognized the value of firearms for the defense of life, liberty and property. But in Florida, a perverse conception of the 2nd Amendment has produced the opposite effect: The cause of gun rights is being used to attack property rights. In 1987, Florida wisely affirmed personal freedom by letting law-abiding citizens get permits to carry concealed weapons. But this year, the legislature decided it was not enough to let licensees pack in public places. They also should be allowed to take their guns into private venues -- even if the property owner objects. The "take your guns to work" law says anyone with a conceal-carry permit has a legal right to keep his gun locked in his car in the company parking lot. Until recently, companies had the authority to make the rules on their own premises. But when it comes to guns, that freedom is defunct. The National Rifle Association says any corporation that forbids firearms in its parking areas is violating the 2nd Amendment. That may sound like a promising argument, since the Supreme Court recently struck down a Washington, D.C., handgun ban as an infringement on the constitutional guarantee. It's not. Robert Levy, the Cato Institute lawyer who participated in the successful challenge of the Washington ordinance, says the Florida law "has nothing to do with the 2nd Amendment." The Constitution, he notes, is a limit on government power, not a constraint on what private individuals or corporations may do. . . . While I admire Steve, his discussion is much too simple here. I agree with him that property rights should triumph, whether I agree with the owner's decision or not, but the situation is not as simple as his newest piece indicates. Federal OSHA rules dealing with guns make it extremely difficult for employers to let guns in areas of employment. As it is the Oklahoma law that was similar to the Florida one was struck down in Federal court because of the claim that the Federal rules took precedent. I wouldn't be surprised if Florida law was similarly struck down in the case that has been filed there. The direct solution would be to get rid of the Federal rules (something that Chapman's piece doesn't discuss) and leave the decision completely up to the property owners. The liability issues and the fact that the courts seem treat the risks from the presence of allowed guns differently than the risks from not allowing guns around create more problems. The NRA argument is wrong, but they are only arguing this because of their desire to get around the Federal OSHA rules and trying not to lose another case in court. They [the Florida Chamber of Commerce and The Florida Retail Federation] argued that the law requiring businesses to allow guns in vehicles in their parking lots constituted an unconstitutional "taking" of their property. In court, the federal judge ruled against them – THEY LOST. They argued that OSHA regulations require them to provide a safe work environment for their workers, which required them to bans guns in parking lots to comply with OSHA requirements. In court, the federal judge ruled against them – THEY LOST. They argued that, as employers, they had an absolute right to control the conduct of their employees and could ban guns from employee vehicles in company parking lots while employees were at work. In court, the federal judge ruled against them – THEY LOST. Those are the three points argued by the Chamber and the Retail Federation. THEY LOST ON ALL THREE POINTS..
At the hearing and in his ruling, the judge complained about language drafted by the legislature saying that it doesn't give businesses clear guidance on whether the laws allows business owners to ban customers from having guns in their cars in parking lots. Rather that clear up the confusion according to the intent of the legislature, he ruled that businesses can prohibit customers from keeping guns in their in the parking lot. The judge upheld the new NRA-supported law. If a business has a gun ban policy, employees who possess a valid Concealed Weapons License are exempt from the gun ban policy and cannot be fired for exercising their gun rights. If a business has a gun ban policy and no employee has a valid CW license, then that business can also ban customers from having guns locked in their vehicles in the parking lot while they shop or conduct business. A business may not search vehicles to see if a person has a firearm; may not ask if a person has a firearm in the vehicle; may not ask if a person has a CW license.